A new study published in the American Journal of Cardiology may point out a link between occupational radiation exposure and brain tumors, after results showed disproportionate reports of left-sided brain tumors among interventional physicians who often conducted exams involving ionizing radiation. This study followed up a report which previously covered nine recent cases of brain cancer among interventional cardiologists, after researchers received 22 additional cases from around the world after publication. The new study includes 23 interventional cardiologists, two electrophysiologists and six interventional radiologists, all of whom had worked between 12 and 32 years at an interventional practice with exposure to radiation. According to Ariel Roguin, MD, PhD, study investigator with the Technion-Israel Institute of Technology, Haifa, Israel, since the publication of the paper, there has also been an additional report of a left-sided astrocytoma in a 52-year-old pediatric electrophysiologist physician, making the total 32 cases. There were 17 cases (55%) of glioblastoma multiforme, five meningiomas (16%) and two astrocytomas (7%). Data were available regarding the side of the brain involved in 26 operators: 22 were left-sided (85%), three right-sided and one midline in an interventional cardiologist who had performed most cases using the Sones technique, in which the head is typically centered closest to the X-ray source. 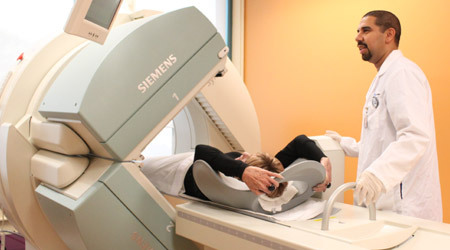 Most labs and radiology suites are designed for the doctors to conduct examinations while on the patient’s right-hand side, which places the radiation source toward the left side of the examining physicians brain, exposing it the most. Lloyd W. Klein, MD, and Professor of Medicine at Rush Medical College in Chicago said, “This is an extremely important paper and one I believe most hospitals and societies are going to try to bury. The findings fit into the category of occupational health and when you identify risks to working in a workplace, whether it’s the coal mine or the cath lab, you step on all kinds of financial and egotistical feet. That is what we found in the Multispecialty Occupational Health Group: the more you go into health impact and incidence of lost time from work, the less anyone really wants you to look at it. The X-ray manufacturers don’t want you to look at it because it’s their design, and if you start criticizing their design, it’s going to cost them money to redesign their equipment. The hospitals don’t want you to look at it because they depend on young people to keep being trained as middle-aged people keep going out with health problems. And training programs don’t want to talk about it because they need to train young doctors to do the same thing as the old doctors are doing. So you have a situation here where no one wants to hear the problem. And this paper really points out the consequences.